Since its founding in 1984, the organization has earned state and national recognition for its integrated health care, housing, and service programs. The Coalition’s comprehensive approach addresses the causes of homelessness, as well as the consequences, offering critical assistance to over 15,000 families and individuals each year. Honoring the inherent dignity of those we serve, affirming their capabilities and fostering their hope that a better life is possible. Using resources judiciously and effectively. Colorado Coalition for the Homeless (the Coalition) was established in 1984 as a 501(c)(3) non-profit corporation. It was founded by a group of individuals with a will to take action on behalf of Colorado’s homeless. They recognized the struggles of working people living in poverty. And they refused to tolerate the dangers faced by those people sleeping in their cars, in tents, or on the streets. Over 30 years later, many of the underlying social causes of homelessness persist, like poverty, shortages of affordable housing, and unattainable health care. 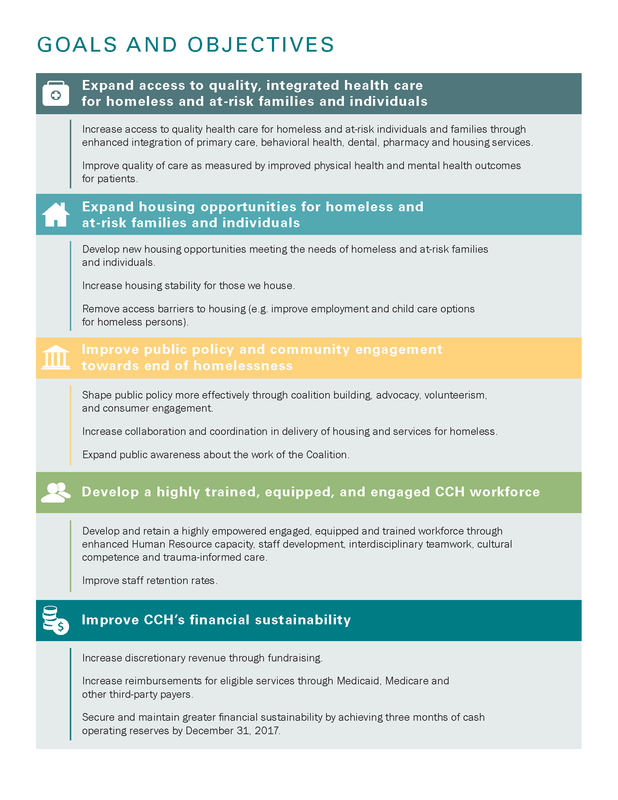 The Coalition’s integrated housing, health care, and supportive service programs have been highly effective at responding to these conditions over time. The Coalition has celebrated many milestones since it's founding. A major milestone for the organization was the opening of Stout Street Clinic in 1985 thanks to a $1.6 million grant from the Robert Wood Johnson Foundation. 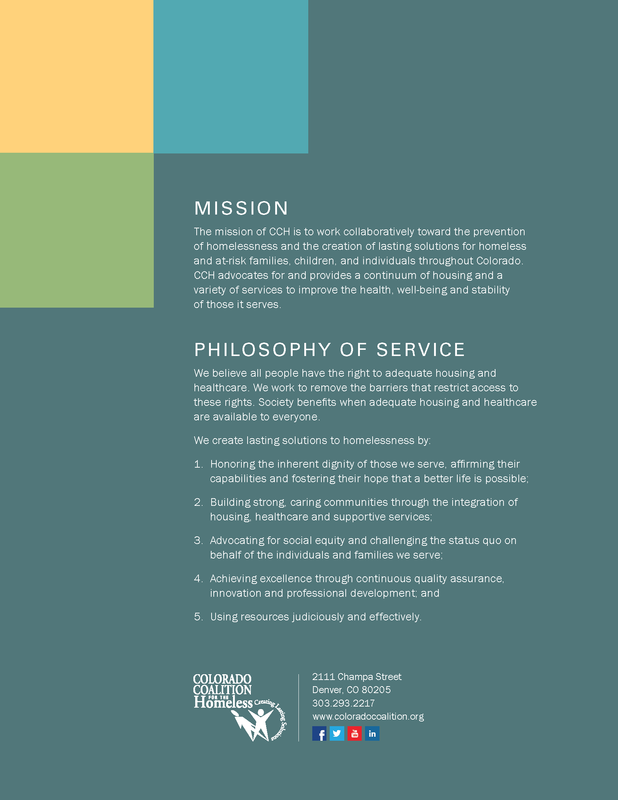 Since the Clinic’s grand opening and subsequent expansion in 2002, the Coalition has become the leading healthcare provider for the homeless in Colorado. The Clinic includes primary and pediatric care, an eye clinic, a full-service pharmacy, a dental clinic, mental health and substance abuse treatment, respite care, and health outreach. In 2014, a new facility opened to replace the Stout Street Clinic, the Stout Street Health. The Health Center fully integrates patient-centered, trauma-informed medical and mental health care, substance treatment services, dental and vision care, social services and supportive housing to more fully address the spectrum of problems homeless patients bring to their medical providers. The Health Center provides integrated health care for 13,000 homeless men, women, and children each year. Colorado Coalition for the Homeless staff, volunteers, and programs have been honored with several awards over the years. In 2002, the Coalition’s President, John Parvensky, received the Ford Foundation’s Leadership for a Changing World Award, recognizing his unique vision and leadership. In 2008, President George W. Bush personally presented the President’s Volunteer Service Award to Cherie Yeager, a volunteer with the Stout Street Eye Clinic. Many of our affordable housing properties have earned national recognition, including Renaissance Uptown Lofts, Renaissance Off Broadway Lofts, Renaissance Riverfront Lofts, Renaissance at Civic Center, Renaissance at Concord Plaza, Renaissance at Loretto Heights, and The Forum Apartments. 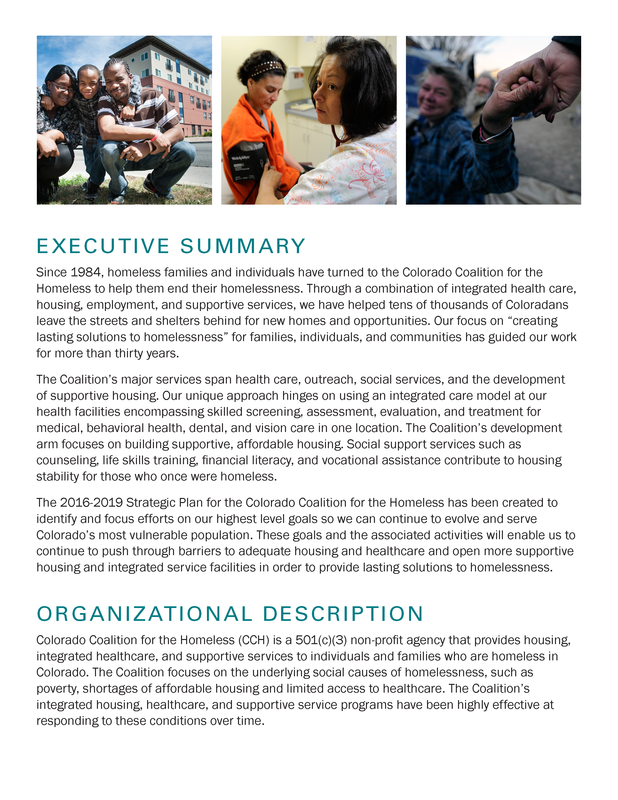 At the Colorado State Capitol, the Coalition has successfully advocated for more than a dozen major legislative efforts aimed at reducing homelessness, expanding affordable housing and protecting individual rights. In 2012, the Coalition lead the campaign against the city's unauthorized camping ban ordinance. In 2010, the Coalition worked with the Economic Opportunity Poverty Reduction Task Force to advance and pass bills that would help cut poverty in half. In 2009, the Coalition led an aggressive nine-week campaign to restore the state's Aid to the Needy Disabled (AND) program. In 2008, the Coalition helped ensure the passage of the Warranty of Habitability law. The Colorado Coalition for the Homeless was honored to receive the Dr. Martin Luther King, Jr. Humanitarian Award in 2017, which recognizes humanitarian leaders who live and lead in the example of peace and equality exemplified by the life of Dr. Martin Luther King, Jr. The Coalition's Stout Street Health Center received the 2016 National Council for Behavioral Health Award of Excellence in the Helping Hands category for its innovative approach to Integration and Wellness. 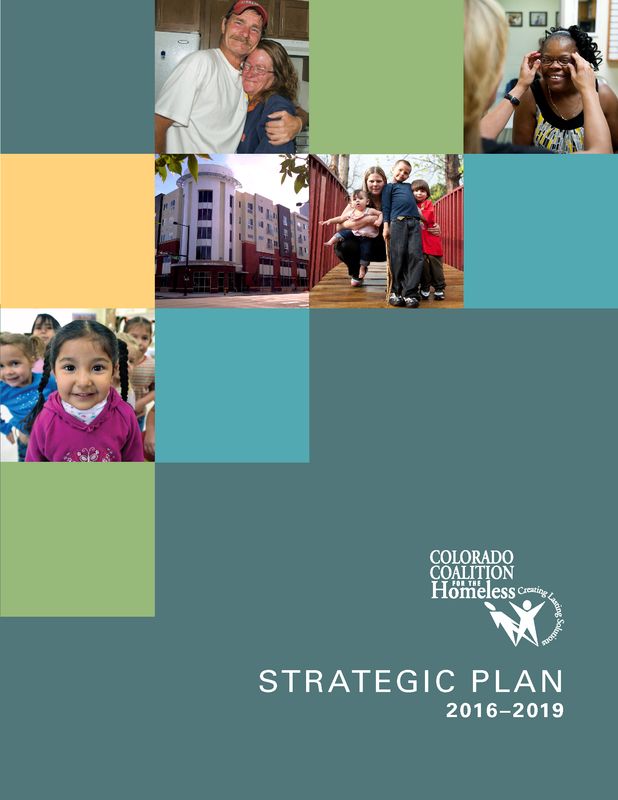 The Coalition's Renaissance Stout Street Lofts was awarded the 2015 Housing Colorado NOW! Eagle Award, honoring projects that help ensure safe, decent, affordable housing for all Coloradans. The Coalition's Stout Street Health Center and Renaissance Stout Street Lofts received the 2014-2015 Downtown Denver Partnership's Best New Development Award for it's contribution and positive impact on Downtown Denver. The Coalition's Renaissance Stout Street Lofts was named the 2015 Affordable, Merit Winner by Multi-Family Executive Awards, celebrating outstanding individuals, projects, and programs in the industry. The Coalition's Renaissance Children's Center received the 2015 Children's Champion Award from the TRIAD Early Childhood Council for it's commitment to improving the lives of children in the community and across the state. The Coalition's Fort Lyon Supportive Residential Community received the 2015 Award for Excellence from the El Pomar Foundation, which recognizes the state's highest performing organizations. John Parvensky, Coalition President and CEO, was awarded the Carle Whitehead Memorial Award in 2015 for his 30 years of dedication to furthering civil liberties and social justice for Colorado's homeless. Carol Rykiel, Dental Hygiene Team Lead at the Coalition's Stout Street Health Center, was one of five recipients of the Outstanding Leadership, Collaboration and Service in Health Care Award in 2015, and she was the only non-physician who received an award. Dr. Malcolm Tarkanian, Eye Clinic Volunteer at the Coalition's Stout Street Health Center, was awarded the 2016 CCHN Volunteer Clinician Award for co-founding the Eye Clinic and his continued commitment to providing vision services to Denver's homeless and underserved communities.